As any historian who has attempted to reconstruct the British media landscape of the twentieth century will know, finding even basic information about programming in the past can be nigh on impossible. Broadcast media have historically been ephemeral, disappearing as soon as they are over and leaving few if any physical traces. Recovering these broadcasts has never been an easy process. Copies of many programmes were never made, were never kept, or were destroyed (deliberately or otherwise), leaving them lost forever. This is something historians dealing with broadcast media have learned to live with, but even finding out about the existence of programs and basic information about them has often proved extremely difficult. Our image of the broadcast media landscape of the past is an incomplete one, pieced together from more permanent, textual traces of these fleeting productions. However, much progress has been made in reconstructing the history of broadcast media in recent years. One invaluable resource is the BBC Genome Project, launched for public use on 14 August 2014. This database is the result of a long effort by the BBC to digitise every issue of the Radio Times published between 1923 and 2009. From these digitised issues, every BBC program listing has been extracted and made fully searchable and available to the general public. The result is a large, easily navigable, and readily accessible database of nearly more than five million BBC radio and television broadcast listings from most of the last century – a database ripe for use by historians. The information that can be extracted from the Radio Times back catalogue is substantial. Each broadcast has its own page with a unique, stable identifier making it easy to refer back to and share. This page includes the name of the program, the channel or radio station it was aired on and the date and time of broadcast. A brief synopsis of the broadcast is often included, though these are vary in depth, dependent on the editorial decisions of contemporary Radio Times staffers. Further information on contributors to the broadcast (actors, writers, directors, and producers, and even panellists, guests, and hosts) is also available, as well as a handy link to the issue which the listing has been pulled from, allowing you to look up what else was being broadcast that same day on any BBC channel. 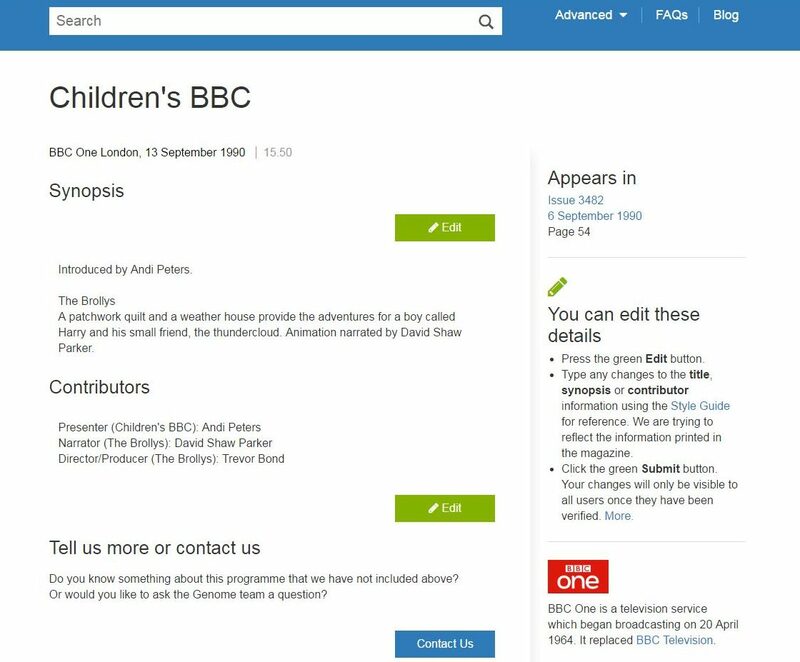 There are a few different ways to navigate the BBC Genome database. The simplest is through a straightforward text search: just enter the terms you want to look for and hit enter. This will search not only titles but also synopses and contributors. Unfortunately, this free text search does not use the standard boolean operators used by Google and most other search engines (such as AND and OR), so instead of making use of several different operators it is useful to know how to hone your searches. If you want to search for an exact phrase, just put it in quotes (e.g. “Doctor Who”). To search for any of multiple terms, put a vertical bar between them (e.g. fruit|vegetables). You can also narrow your search by specific field values, including title, synopsis, people, issue, and year. To do so, just add @(field name) (field value). For example, adding @year 1984 to a search will return results only from that year. There are even more options under the ‘Advanced Search’ if you would like to perform an even more precise search. If you would prefer to browse the database rather than performing a particular search, there are a couple of ways to proceed. 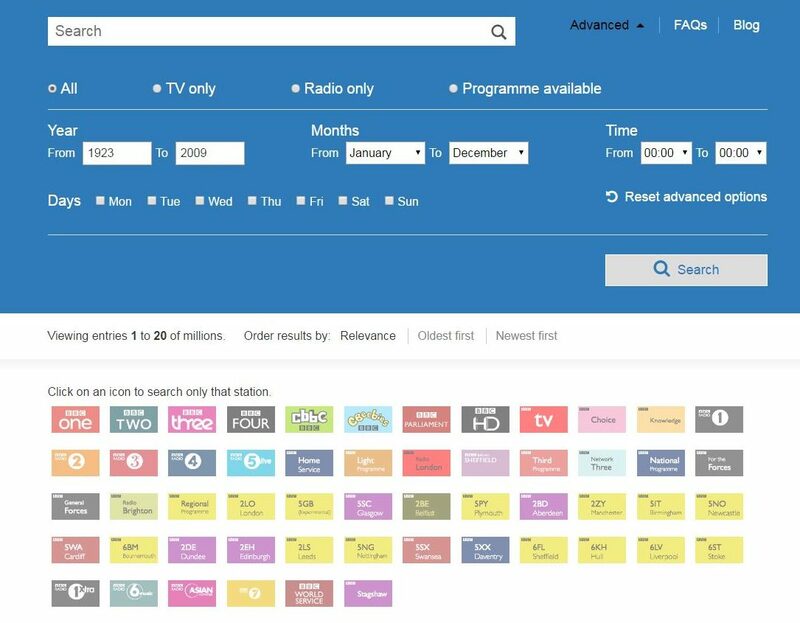 If you click ‘TV’ or ‘Radio’ you can choose a particular television channel or radio station to explore, and then find a particular date you are interested in and see what was on that day. By clicking ‘Year’ or ‘Issues’ you can browse the archive by selecting a particular issue of the Radio Times as sorted by date. This will then display all the listings contained in the issue divided by date and channel/station. Clicking on a channel/station on a particular day will then display the relevant programming schedule. It is important to note that the BBC Genome Project is, however, still only officially in its beta stage. This means that there are still some transcription errors floating around the listings in the archive. Helpfully the developers have allowed the public to make corrections to any mistakes they encounter directly from a given listing’s page: each field has an ‘edit’ button where you can submit corrections which are then passed on to the development team who moderate and implement them. Hundreds of corrections have already been made, and the quality of information is always improving, but definitely expect to encounter a few formatting and spelling errors as you browse the archive. Overall, though, this is only a minor issue with what is otherwise a tremendous resource for twentieth-century British historians.